Norton, Andre. 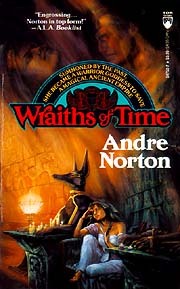 Wraiths of Time . Tor 1992. Summary: A woman from our world is drawn across time to a central African empire created 2000 years ago by fugitives from conquered Egypt. Published: Atheneum 1976 (0689500572); Fawcett Crest 1976 (0449235327); and Tor 1992 (0812547527).